This is the Changing Gears Drill from the Short Range match. The ability to quickly transition between multiple targets and deliver accurate hits takes training and practice. The drill is designed to practice transitions from precise shots to controlled pairs. 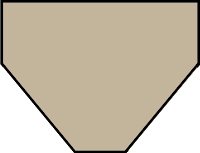 The targets are IDPA-style with a Gunsite-sized head scoring area that is a trapezoid as shown. Any shot outside or touching the line is a -1 second off your time and shots that miss the head are -5 seconds. Set up four targets spaced 3 feet apart at 10 yards and face the center target. For string #1: At the beep shot from left to right one head shot on T1, 2 body shots on T2, one head on T3, 2 body on T4. For string #2, from right to left, one head shot on T4, 2 body shots on T3, one head on T2, 2 body on T1. Then for string #3 one head shot on each target. When we use this drill as a stage in the Short Range Match we start in a different position for each string. One string starts with hands at sides, one with hand on pistol, and one with hands in surrender position. We record the draw times and this lets the shooter know how fast their draw is from the respective starting positions. The target distance, spacing, and head shot scoring limitations force a greater degree of focus on the shooter's part and improves their transition skills. The overall time and target score are still important and Master-level shooters who are on their game will deliver six perfect hits in around 4.0 seconds. A proper transition in a match is executed as follows: As you acquire your first target, obtain a good sight alignment/picture and press off the shot. The instant you fire the shot, move your eyes to the exact spot where you wish to hit on the second target and transition the pistol to that target while prepping the trigger for the next shot. The instant the pistol arrives at the second target and you confirm the sight picture, press off the next shot. And so on. If you record your runs, you can analyze draw times, transition times, and split times. A 60 frame per second video or any decent timer can provide you this information. For string #1, I had a draw time of 1.84 with 0.85 of dwell time. * A total time of 5.39 (not great--my first stage of the day--no excuse however). My average transition times were 0.88 seconds and my splits for the 2 body shots were 0.18 and 0.13 respectively. For string #2, I had a draw time of 1.85 with 0.74 of dwell time and a total time of 4.46. My average transition times were 0.73 seconds and my splits for the 2 body shots were a little slower at 0.22 and 0.21 respectively. For string #3 head shots only, I had a draw time of 1.61 with 0.65 of dwell time and a total time of 4.10. My average transition times were 0.83 seconds. Learning to move your eyes takes practice. The eyes can move much faster than you can move the pistol. Visually acquiring and then concentrating on where you intend to place the next shot reduces transition and dwell time (see below). The short-range course of fire match follows proper safety principals and generally has targets at no more than 10 yards. Otherwise, it is a regular course of fire, with many stages requiring proper use of cover, a reload, movement, etc. 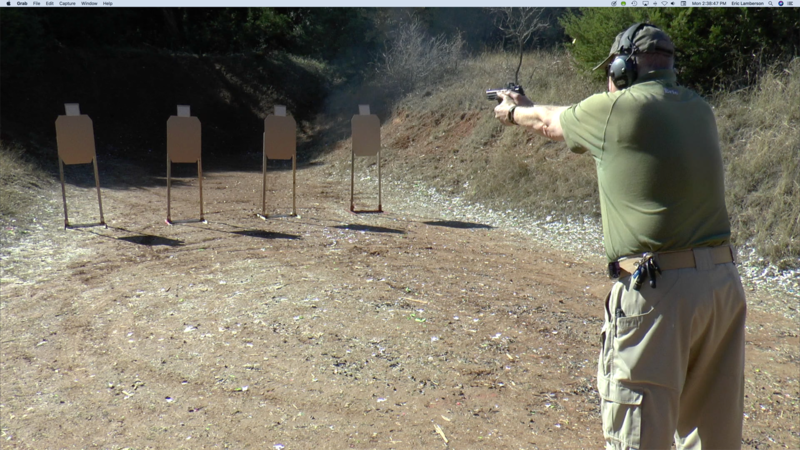 Come out and shoot with us on the 2nd Sunday at Cedar Ridge Range in San Antonio. *I define dwell time as time I appear to have the pistol on the target, but I have not fired. Somewhat subjective. Thugs in the Driveway? HOME INVADERS?